If you ask five people what mindfulness is, you may get five different answers. It’s important to look to the wisdom of those who have been practicing and teaching mindfulness strategies over the years. Jon Kabat-Zinn, PhD and professor of medicine emeritus at the University of Massachusetts Medical School, established the world-renowned Mindfulness- Based Stress Reduction Clinic in 1979 and helped bring mindfulness to the mainstream. Jon Kabat-Zinn’s clinical research focused on mind-body connections and strategies to help individuals suffering from stress and chronic pain. He defines mindfulness as “the awareness that arises through paying attention on purpose, in the present moment, nonjudgmentally, in the service of self-understanding and wisdom.” Mindfulness is understanding our mind and noticing our present experience with clarity by using all of our senses without attached judgment. Why is Mindfulness Needed in Education? Schools are a sanctuary of learning most of the time, but sometimes they can become stressful, anxious places for students, teachers, and administrators. Mindfulness is a way to keep our brains healthy, support self-regulation, and aid in effective decision-making to protect ourselves from toxic stress. In intense situations, our fight-or-flight response kicks in instinctively because our brain activates neural pathways of fear. But these same neural pathways can be activated by chronic stress due to prolonged day-to-day worries, ruminating about a negative event, or replaying repeated feelings of guilt. The more these high- stress-response fear pathways are activated, the more they become our default setting. Mindfulness-Based Stress Reduction (MBSR) strategies are practiced and taught in health care facilities, yoga studios, prisons, law firms, and schools. Mindfulness isn’t a religion, a disciplinary tool, meditation, or the absence of thought, nor is it simply calmness or happiness. 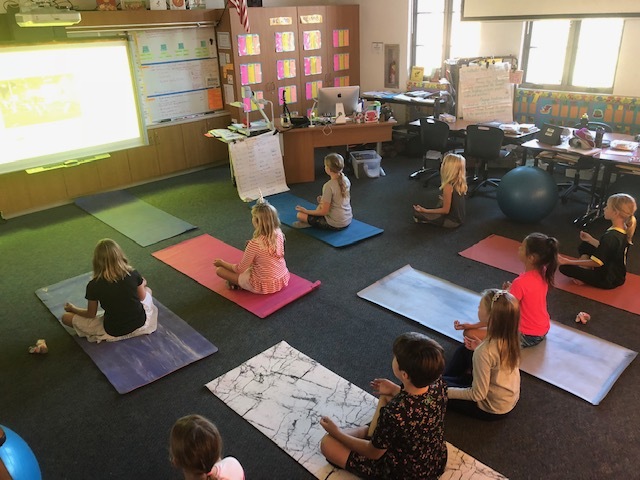 Regular daily mindfulness practice has been shown to reduce stress and anxiety, improve attention, impulse control and regulation, increase empathy and understanding of others, and promote sense of calm and the ability to be present to yourself and others. Many, if not all, of these benefits can positively affect teaching and learning.